Combine memories of the past with the opportunity to help usher people into their future with the Hunt-Phelan mansion in Memphis, TN. This five-bedroom home and event venue, measuring more than 10,000 square feet, is now on the market for $3.5 million. The property is primarily used as a wedding and event venue nowadays. A buyer would need to be willing to honor the weddings that are booked through next year. But beyond that, the possibilities loom as large as the home’s history. Built in 1828, the home is listed on the National Register of Historic Places, primarily due to its role in the Civil War. The design of the home was based on plans by Robert Mills, who designed the U.S. Treasury building and Washington Monument. When the war began, the homeowners fled the Southern plantation, which was then was occupied by the Union Army. Grant used it as his headquarters during the federal occupation of Memphis, and in 1863 it became a military hospital. Hanging in the home is a photograph taken during this era, showing the Union soldiers with their tents and campfires on the front lawn. Jefferson Davis, who was president of the Confederate States of America, was a frequent visitor to the home, and some believe his wife, Varina, planted some of the gardens that still remain on the property. It also served as the headquarters for Confederate Gen. Leonidas Polk. After the war, it was used as a Freedmen’s Bureau for the education of freed slaves until it was purchased by the Phelan family. The property has since stayed with the family. The mansion sits behind a metal gate and a circular driveway with a fountain. Graceful columns adorn the front exterior. 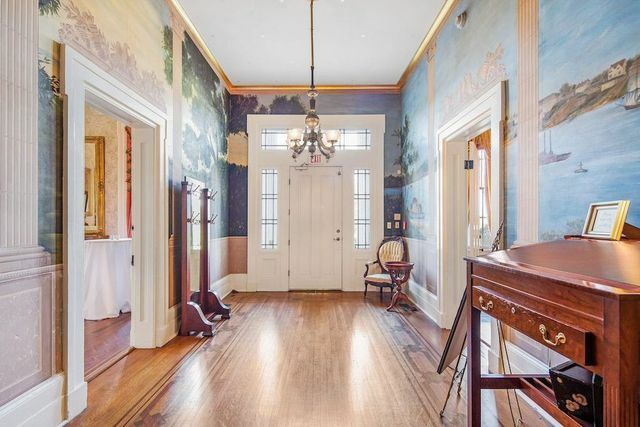 The original hardwood flooring runs throughout the first floor, and much of the decor is historic, including the hand-painted wall murals. The stair risers still bear marks from soldiers’ boots. “Nobody’s ever fixed those because nobody ever should. It should stay there,” says Garland. 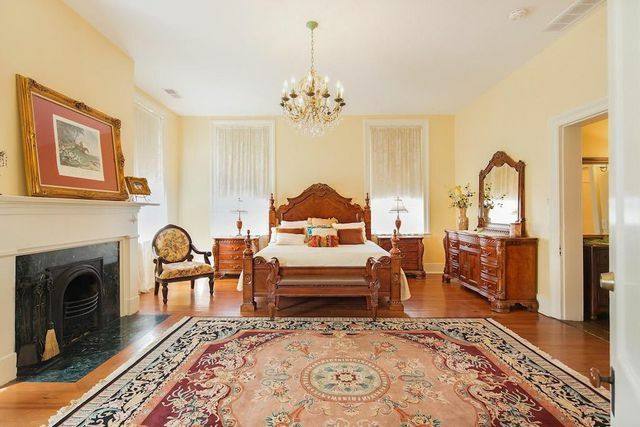 The bedrooms are en suite, and there are an additional five half-baths. The property was once a restaurant and bar, and still has a commercial kitchen for events. With six fryers and walk-in fridge and freezer, no holiday dinner will be too large of an undertaking. In addition to the main house, the 6.24-acre property has a few smaller buildings. 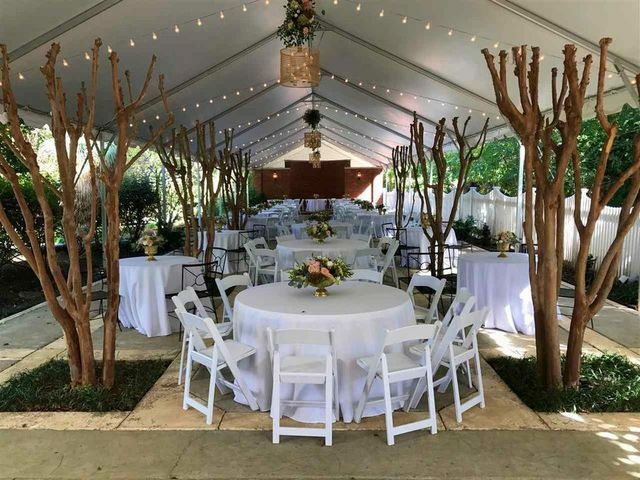 An outdoor tented patio can seat up to 275 guests. There’s also a recently built garage for eight cars, as well as a covered parking area. These recent structures were constructed with reclaimed brick and match the architecture of the historical house.